As a relatively young global network (founded in 1992) VML noticed that while it's continuing to expand across the world, there has been some trouble developing a connection between its two biggest markets, the U.S. and China. Another problem facing VML's China office is the major issue of retention, with turnover in some agencies reaching nearly 50 percent. VML wanted to do something to bring the entire network closer together, and cut back on turnover, but only a small percentage of the current VML China team speaks English, and vice versa, so kicking off any communication between the two posed some problems. Then, VML's global CEO Jon Cook took a trip up to Syracuse University last year for a speaking gig and came away with an idea: the China Z Fellowship Program. "This program is really attacking the idea of true, active sharing of perspective in the VML world with the idea that not all of the U.S. is going to get the opportunity to go to China, but we are a better company if we have that perspective in our business and our culture," Cook said. To kick off the fellowship, VML went through an intensive interview process among Syracuse University students and selected five recent graduates, all originally from China and planning to return home after graduation, to spend six months at the agency's Kansas City office. 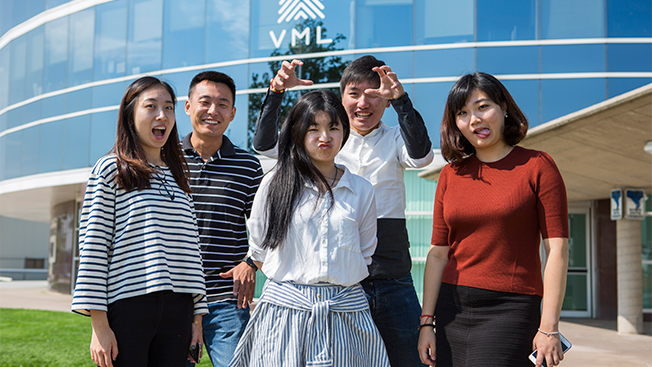 At the end of the six months, the five VML employees will return to China and work at VML's China office in Shanghai for a minimum of two and a half years with the idea that they will take back new ideas and ways of thinking to VML China. While connectivity within the VML network was a major driver for the program, Cook noted that VML "had more clients and client partners that are using more of the VML global network so we are trying to make sure that our culture and our connectivity are evolving as fast as our clients are evolving across the globe." China Z is similar to an intern program and was built using things VML has learned from past intern programs but has a bit of a twist to a traditional internship or fellowship. For each of the five fellows, the agency selected five captains from different client teams including Bayer, Kimberly-Clark, Bridgestone, Ford and PepsiCo/Gatorade. "We could have put them all in one team and have them do a project for one client, but our decision was to have a broad range of impact across them and our company," Cook said. The fellows, who all developed a close relationship as students at Syracuse University, aren't completely separated throughout the process. Part of the program asks the five recent graduates to put together three presentations throughout the six-month period at the agency designed to teach VML's Kansas City office about Chinese culture, marketing and other trends. Added Yuki Yu, a VML China Z fellow working the Bridgestone account: "It will be great to know how the people work and then you can pass this culture back to China and bring this wonderful, amazing experience back to the China office. This program is a bridge to connect the U.S. and China and bring people together because we are all VML and under the same culture. It just brings us closer." While the fellows are just over two months into their program, Cook noted that the idea moving forward is to create similar programs throughout the network and eventually bring all offices from all over the world closer together.